The night of Hallows Eve or the Festival of Samhain for those of the darker world... Didn't the Druids put a pumpkin on their porch to signify the sacrifice of a family child for whatever requirement they had....? My history is vague and melted with too much Dungeons & Dragons as a youth. We took my son(Batman) and daughter(Minimouse) out for an evening of candy collecting. We met the neighbor kids, did a couple of laps and headed home to inventory the loot. I didn't realize how many kids were in our area until we were out. That's cool, more play friends for them when growing up. 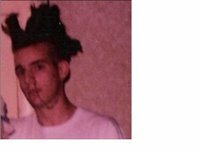 Twin fin mohawk circa 1992. Pre digicam so the scanned photo is just that. Funny how we go through changes in life. The only two things I wouldn't mind still having from this photo is maybe the hair(minus the Elmers Glue I used to us to get it to stand up)coverage and the combat boots that I had on..comfy. I scored them from a lab partner at tech school. I remember the large NIN logo I painted down the side of them. Oh to be 19 again. ha! Bike orders are gonna kill me. Writing clothing orders is painful. Our area doesn't sell a lot of clothing at full retail. People either buy it online, year old, discounted 35% or on the leftover rack near the end of the season. I am scratching my head wondering why you should try and make the margins that you do on apparel? God love the ladies, they like to try on the items. Check their look in the mirror, feel the fabric and buy it then. The guys seem to not do that. Shorts do well as do gloves. That part of the order isn't hard to concock. The road line as mentioned before did well for us this past summer. I am looking forward to next summers momentum on that segment. More custom fittings, sell more Campy and get more custom footbeds under riders too! One of my missions for next summer is to get the moutain bike love into the shop. There is a local club that does a fantastic job maintaining our trails and organizing events such as poker runs, destination rides and advocacy sessions on the trails. Trail ride more, dig more, give back more. Here is my weapon of the trail. 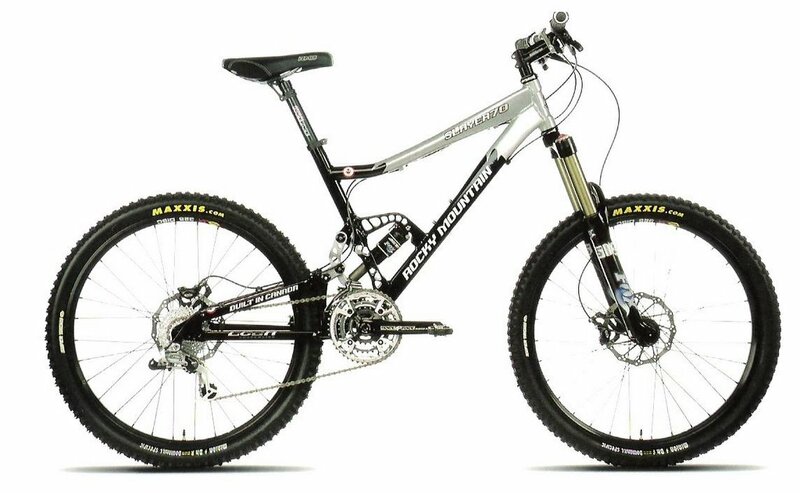 2006 Rocky Moutain Slayer. Faxed in the order for it today. I haven't ridden a full suspension rig in almost a decade. Not since the first gen Jamis Dakar Team...NORBA days! I have the hartail Voodoo in my quiver of bikes. Old and faithful. I picked this bike for a few reasons. #1) I am a confessed bike geek, technology can get me hot and bothered when done right. This bike is the XC version of a Jenna Jameson lap dance. So friggen nice you can't leave your seat! #2) Rocky builds their stuff tight. Tolerance, paint, parts spec, wheelsmith in house and built to last. If you like to keep a frame for a long time, this is your company. #3)Riding a Rocky means your on a bike that has had LIMITED quantities of people touching it. High quality assurance, everything in house, not out sourced to Taiwan like that other big hit brand Santa Crak... I am doomed to have 'South of Heaven' stuck in my head while riding it. Oh well, as long as I don't burst into flames. Dude, love the hair. Mine was shaved off for a long, long time. Still prefer that look to just about anything ever.